You “won” NaNoWriMo. Congrats and awesome job. Now take a deep breath. And DON’T send newly finished novels to agents. Ever. If you’re high on the thrill of finishing a novel and you’re just utterly tickled with your project, you will need a little bit of time to come down from that cloud and read your own book with a critical eye. This is definitely something you should do repeatedly before it gets submitted anywhere. You may be surprised by how many mistakes you made, how many thoughts you forgot to tie up, how many sentences you can improve, and how much better you can make it with some polish. This step cannot be skipped by running spellcheck. It is also highly recommended that you get a test audience to read your book after you’ve gotten it as good as it can get on your own. Test readers will be able to give you perspective you may not realize you need. You need time to develop your pitch materials as well. If you already had them done before writing the book, that’s great, but constructing a synopsis and a query letter also requires time and thought. But finally, agents are not going to be impressed that you wrote a book quickly and “won” NaNoWriMo. Objectively, it’s quite a feat to write a book in 30 days, yes, but agents become interested in you only if that book is a GOOD book. You owe yourself some incubation time to make it better, and submission is not a race. You don’t want to be one of the people in the crowd waving a manuscript and drooling, charmingly enraptured with your story but woefully unprepared to go professional. 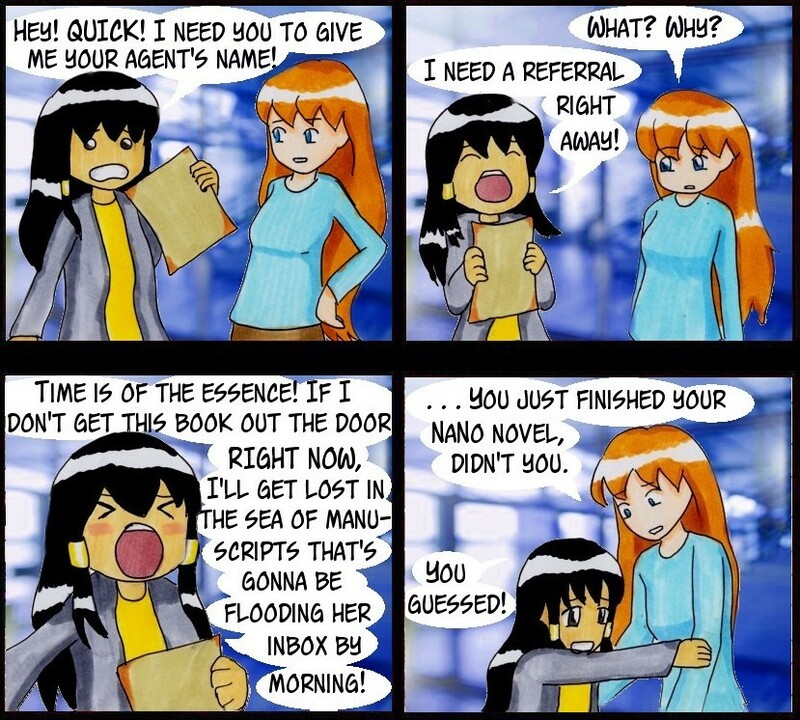 With very few exceptions, the only NaNo novels you should be submitting directly to agents on December 1st are NaNo novels you wrote a year ago. Hey, Atlanta Nights was published, and written by writers more talented than I have shown in 61 years. So careful editing isn’t always necessary to succeed as an author. Of course, it helps to have a publisher that publishes *everything*. In the words of Solomon “All is vanity”. He got published, too, but long enough ago that his estate isn’t receiving royalties.